hsa-miR-486-5p is located on the chromosome 8, in the region which contains potential tumor-suppressor genes and is often deleted in various types of tumors. hsa-miR-486-5p gene was first cloned from the fetal liver. Reduced miR‑486-5p expression is a frequent molecular event in human malignancies. Deregulation of cancer-related miR-486-5p is a common event in both benign and malignant human breast tumors. 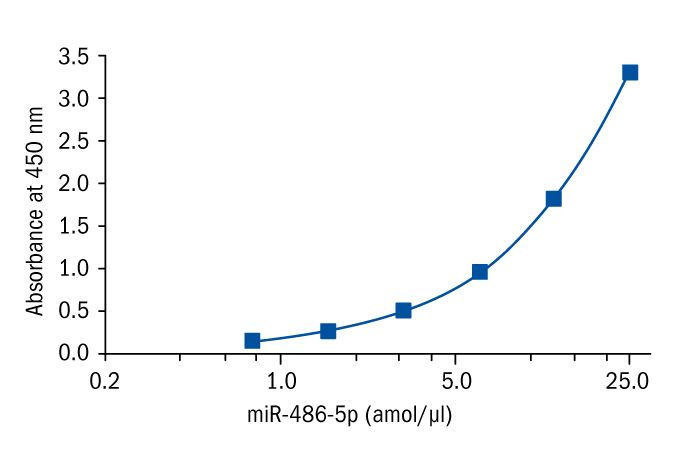 miR-486-5p is one of the most downregulated miRNAs in lung tumor tissues. Its decreased level in circulation indicates lung cancer progression and metastasis. Thus, serum miR-486-5p has a great potential to serve as a marker in clinical diagnosis of lung cancers. Several studies have also shown aberrant miR-486-5p expression and its prognostic value in digestive system cancers. miR-486-5p may become a novel target in treatment of patients with gastric cancers. Other cancer types associated with deregulated miR-486-5p levels are hepatocellular carcinomas and prostate cancer. WANG, J., et al. Downregulation of miR-486-5p contributes to tumor progression and metastasis by targeting protumorigenic ARHGAP5 in lung cancer. Oncogene, 2014, 33.9: 1181. ZHU, Jianjie, et al. Expression profile analysis of microRNAs and downregulated miR-486-5p and miR-30a-5p in non-small cell lung cancer. Oncology reports, 2015, 34.4: 1779-1786. TAHIRI, Andliena, et al. Deregulation of cancer-related miRNAs is a common event in both benign and malignant human breast tumors. Carcinogenesis, 2013, 35.1: 76-85. LI, Ying; LIANG, Li; ZHANG, Chun-yang. Isothermally sensitive detection of serum circulating miRNAs for lung cancer diagnosis. Analytical chemistry, 2013, 85.23: 11174-11179. TIAN, Fei, et al. Aberrant miR-181b-5p and miR-486-5p expression in serum and tissue of non-small cell lung cancer. Gene, 2016, 591.2: 338-343. CHEN, Hui, et al. Expression and prognostic value of miR-486-5p in patients with gastric adenocarcinoma. PLoS One, 2015, 10.3: e0119384. REN, Chuanli, et al. miR-486-5p expression pattern in esophageal squamous cell carcinoma, gastric cancer and its prognostic value. Oncotarget, 2016, 7.13: 15840. HUANG, Xin‐Ping, et al. MicroRNA‐486‐5p, which is downregulated in hepatocellular carcinoma, suppresses tumor growth by targeting PIK3R1. The FEBS journal, 2015, 282.3: 579-594. YANG, Yang, et al. The miR-486-5p plays a causative role in prostate cancer through negative regulation of multiple tumor suppressor pathways. Oncotarget, 2017, 8.42: 72835.